It turns out that when hard drives fail, they don’t all fail completely. In fact, most fail silently, getting worse and worse as time moves on, causing bitrot and other issues. I had a suspicion that one of my drives was failing so I thought I would test it. The tool for the job: badblocks. This is a destructive write test – it will wipe the disk. You can also run a non-destructive test, but for new disks you can go ahead and wipe them. I also use badblocks to ensure old disks can still be trusted with data. It’s great for “burn in” testing to ensure a drive won’t fail. Thanks to Ubuntu Forums for the info. grep -r “text string to search” . That did the trick! Thanks to cyberciti.biz for the information. SSMTP is a very simple SMTP mail program which is used to send e-mails to a target server. It’s not a fully feature e-mail server but simply passes e-mails on. I first became acquainted with it because it’s the only mail server you can install on Citrix Xenserver. I now use it with all my servers because it’s very easy to configure. There is only one config file to worry about: /etc/ssmtp/ssmtp.conf. To configure it to use an SSL connection (for gmail or if, like me, your ISP blocks port 25), add the following options, changing the brackets with your mailserver, username, and password. If you just pasted the above config into your ssmtp.conf be sure to check the resulting config file for duplicate entries. It’s as simple as that. All outgoing mail will be sent to the server specified above. Thanks to Xen 4.3, it is now possible to suspend / resume dom0 while domUs are running. Unfortunately, if you have a VM actively using pci passthrough, the whole machine completely locks up about 10 seconds after resuming from S3 sleep. As Xen is a lot more geared to servers I realize I might be an edge case; However, I would really like to be able to suspend my entire machine to S3 with VMs actively using PCI passthrough (in my case, a video card and USB controller). For quite some time I thought I was out of luck. After learning about the hot swapping capabilities of Xen 4.2+ and its pciback driver, I thought I would take another whack at it. My solution is to create a custom script which detaches all PCI passthrough devices on the VM before going to sleep. That same script would re-attach those devices to my VM on resume. My dom0 is currently Linux Mint 16 so I placed the resulting script in the /etc/pm/sleep.d/ directory and named it 20_win8.1 . It works like a charm! I can suspend and resume to my heart’s content without having to worry about if I remembered to shut down my VM first. My script is below. Be sure to modify it for the BDF of your devices and the name of your VM(s) if you decide to use it. In my experiments with Xen to make dual booting obsolete, I’ve come across a need to hotplug PCI devices between dom0 and domU; Specifically, the SATA controller that my DVD-RW drive is connected to. My DVD drive supports Lightscribe, which unfortunately is not nearly as strong in Linux as it is in Windows. You can get it to work but the label maker program is extremely basic. If I want to burn a lightscribe disc and have it look at all pretty it requires Windows. The way I was doing PCI passthrough before was pretty inconvenient. It involved editing /etc/xen/pciback.conf and adding the bus:device.function (BDF) of the device I want to pass. This causes that device to be claimed by the pciback driver at boot time. That’s all and well and good for the virtual machine, but what if you want your dom0 to use that device? You would have to remove the device from pciback.conf and reboot the machine. The -r in pci-assignable-remove is necessary – it instructs xen to load the original driver that was loaded before we invoked pci-assignable-add. If you are using the xm toolstack instead, simply replace xl with xm. I tried ejecting the SATA controller and scanning for new devices as described on various forums, but that didn’t seem to work. The fix for me was to reboot the VM. Rebooting caused the PCI device to detach, so after the VM finished rebooting I had to re-issue “sudo xl pci-attach win8.1 03:00.0” to attach it again. Triumph! I tried to make the second pci-attach command unnecessary by adding pci=03:00.0 to my virtual machine’s configuration file, but since I was passing a storage controller it kept trying to boot from drives attached to that controller instead of the virtual machine’s hard drive. I tinkered around with the config file for a while to try and get it to boot from the VMs hard drive again but couldn’t get it to work. Since everything works by simply issuing pci-attach twice I gave up and just moved on. In one final bout of tinkering I discovered that if you issue pci-attach right after you boot the VM but before the OS finishes loading, it works on the first try. So the moral of the story here is Microsoft weirdness requires you to jump through some minor hoops to get this to work. No complications here, although there is a funny bug. 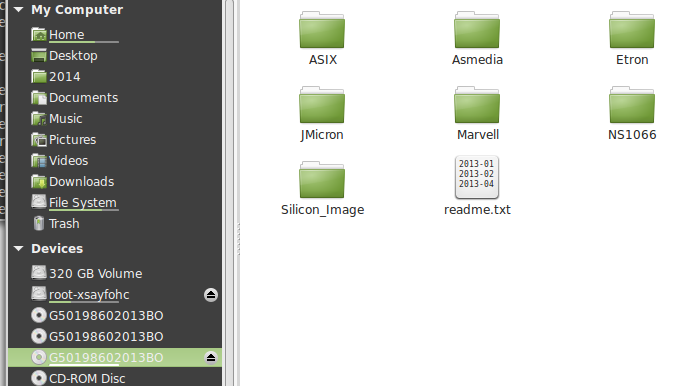 The file manager used in Linux Mint 16 gets confused and keeps adding CD ROM entries each time I pass the drive back and forth, but everything still works – it’s just a visual bug. The drive is now accessible by dom0 once again. Success! When it comes to a virtual machine’s clock my experience with other virtualization solutions has been that it’s automatically synchronized with the host machine. I didn’t notice until recently that this is not the case with Citrix Xenserver – at least when it comes to PVHVM machines. I tried installing openntpd on each of my VMs and setting it to my internal NTP server (which in turn synchronizes with the web.) After a few days I was frustrated to see that the servers were still not in sync – some were minutes behind while others were inexplicably minutes ahead. Some of this might have to do with my experiments on live migrating these VMs a while back. At any rate, it was clear that openntpd failed to do the job. Some research revealed that there is a bug where it reports adjusting the clock when the real status was an error. That little bug cost me an hour or two of digging and troubleshooting. Very frustrating. 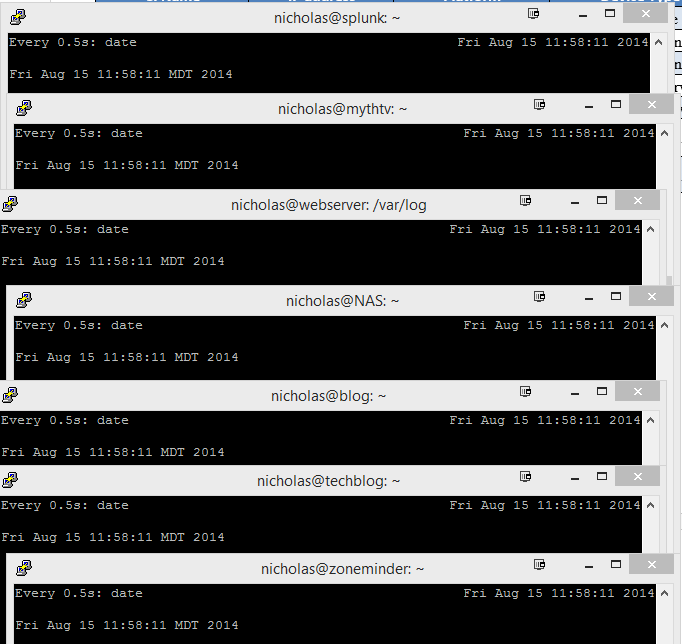 I switched to plain old ntp instead and the problem was resolved within moments. Moral of the story: Make sure you have a proper NTP setup for each of your VMs if you’re going to use Citrix Xenserver.